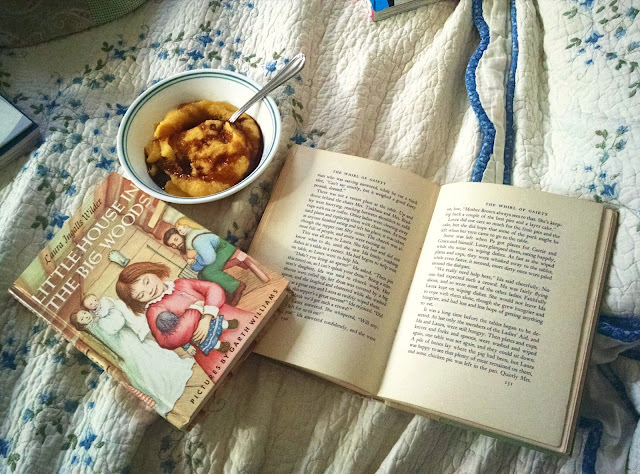 Maybe it was the stress of making it through my very first 31 Day Writing Challenge, but this week I did two things: avoid this blog like the plague and completely immerse myself in the world of Little House on the Prairie. Okay, if I'm honest I'll say that the obsession started before this week, but I've fallen in love all over again. ...except, don't! Because I don't know how many different things I've googled recently, in my attempt to know everything Little House. Last night it occurred to me, Why doesn't Laura ever write about outhouses??? What did they do during blizzards, when they had to go to the bathroom? One of the most satisfying and affirming feelings in the world must be when you do an internet search for something like that and realize that tons of other people have had the same thought. Vindicated. But really I've just needed a healthy, relaxing way to escape at the end of the day. I've needed a safe and familiar place to escape to. And the world of Laura is exactly that for me. It's kind of like the feeling of walking back into your childhood home and realizing how much hasn't changed, and smelling the same familiar smells, and feeling safe and warm. That's Little House for me. This has extended to our car rides, too. I am head over heels in love with the Little House audiobooks, read by Cherry Jones. I've been popping them on every time the girls and I hop into the car and it's been a huge gamechanger. My youngest is not a huge fan of the car, but even if she loses it, the world of Laura helps me stay a tad bit calmer. It's the same sort of balm for my soul as reading the books, except that I get to "read them" while doing something else! It really improves my mood. But even though I read these books as a child, I feel like they really take on an entirely different meaning for me, as an adult. I can't stop admiring Caroline and Charles marriage - their respect for each other, and even the occasional traces of flirting. I love it. I hope that, years from now, my daughters can look back on our marriage with the same sort of fond memories. We aren't going to roast any pig tails, though. I have to draw the fond memories line somewhere. Okay. Confession. I never read the Little House Series! Terrible!! I'm currently reading through/re-reading Anne of Green Gables and just loving it but perhaps this just needs to be my next endeavor. How do you think my boys would like them? I always here moms of little girls loving/lookingforward to sharing this series with them but boys? Anyhow, loved that you had corned mush and molasses. So great!